Unionists have criticised the Sinn Féin leader Gerry Adams after he used what they say was offensive language at a public meeting in Enniskillen, County Fermanagh, on Monday night. Both the DUP and the Ulster Unionists have made it clear they believe Mr Adams was insulting all unionists. Mr Adams has maintained that he was talking only about bigots and racists. Sinn Féin MLA John O'Dowd said Mr Adams was wrong to use the word "bastards", but "equality is not a trick". Audio of the comments containing the swear word was tweeted by Impartial Reporter journalist Rodney Edwards. Mr Adams was apparently answering a question about Sinn Féin's relationship with the DUP in the light of Gregory Campbell's disparaging comments about the Irish language. Mr Adams said he was often asked by republicans "what's the point?" "They weren't blaming Sinn Féin - in fact they were making the point that Sinn Féin were doing their best," he said. "But what's the point? The point is to actually break these bastards - that's the point. And what's going to break them is equality. That's what's going to break them - equality. "Who could be afraid of equality? Who could be afraid of treating somebody the way you want to be treated? "That's what we need to keep the focus on - that's the Trojan horse of the entire republican strategy is to reach out to people on the basis of equality." 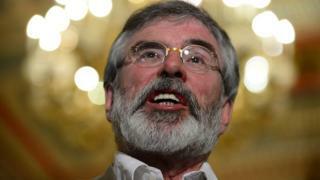 The DUP's Arlene Foster said Gerry Adams' "foul-mouthed abuse had been disrespectful to an entire community". "Respect is a two-way street. The hyperbole from republicans over recent days has been exposed as hypocrisy," she said. "Republicans use the Irish language as a weapon and tonight Gerry Adams confirms that they view equality as another weapon to attack unionists." Ulster Unionist leader Mike Nesbitt described it as "shocking to the point of nausea". "The most shocking revelation is that he considers equality as a 'Trojan horse'," he said. "The audio recording makes clear Gerry Adams thinks equality is nothing more than a tool to be used to manipulate people like me." Alliance leader David Ford said he was "appalled and disgusted" at Mr Adam's comments and called on the Sinn Féin leader to apologise and retract his remarks. "He has actually damaged equality legislation with his remarks." On Twitter, Gerry Adams said "Mea Culpa" acknowledging he was at fault, but insisted he had been talking about "bigots, racists and homophobes". His party colleague John O'Dowd said Mr Adams had been responding to a question about "how Sinn Féin should tackle bigotry within unionism". "Regardless of whether they operate under unionism, nationalism or republicanism, bigotry needs to be called out, challenged and smashed," he said. "We need to use equality to do that." Mr O'Dowd said Mr Adams should not have used that word. "Everybody makes mistakes in unscripted performances, but there is a difference between an unscripted performance and somebody making a scripted speech that is then placed upon the party website," he said.